Illustration of the early solar disk, with an inset image of a blue hibonite crystal, one of the first minerals to form in the Solar System. © Field Museum, University of Chicago, NASA, ESA, and E. Feild (STScl). Our Sun’s beginnings are a mystery. It burst into being 4.6 billion years ago, about 50 million years before the Earth formed. Since the Sun is older than the Earth, it’s hard to find physical objects that were around in the Sun’s earliest days—materials that bear chemical records of the early Sun. 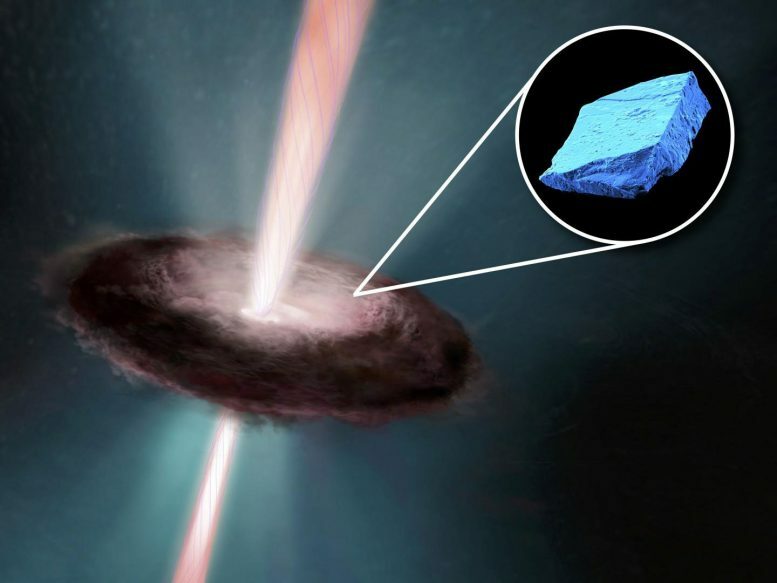 But in a new study in Nature Astronomy, ancient blue crystals trapped in meteorites reveal what the early Sun was like. And apparently, it had a pretty rowdy start. 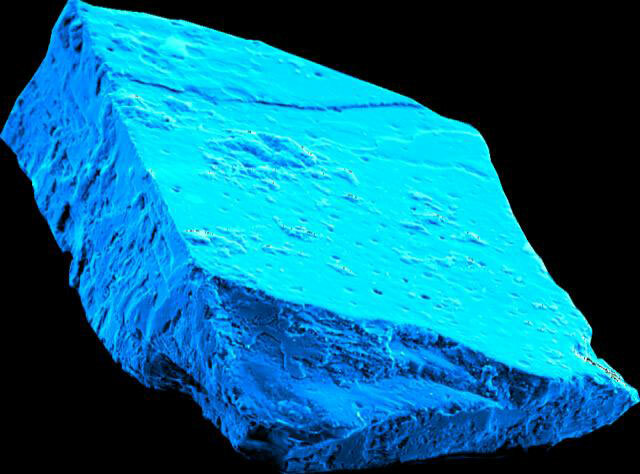 The minerals Heck and his colleagues looked at are microscopic ice-blue crystals called hibonite, and their composition bears earmarks of chemical reactions that only would have occurred if the early Sun was spitting lots of energetic particles. “These crystals formed over 4.5 billion years ago and preserve a record of some of the first events that took place in our Solar System. And even though they are so small—many are less than 100 microns across—they were still able to retain these highly volatile nobles gases that were produced through irradiation from the young Sun such a long time ago,” says lead author Levke Kööp, a post-doc from the University of Chicago and an affiliate of the Field Museum. In its early days, before the planets formed, the Solar System was made up of the Sun with a massive disk of gas and dust spiraling around it. The region by the sun was hot. Really hot—more than 1,500 C, or 2,700 F. For comparison, Venus, the hottest planet in the Solar System, with surface temperatures high enough to melt lead, is a measly 872 F. As the disk cooled down, the earliest minerals began to form—blue hibonite crystals. “The larger mineral grains from ancient meteorites are only a few times the diameter of a human hair. When we look at a pile of these grains under a microscope, the hibonite grains stand out as little light blue crystals—they’re quite beautiful,” says Andy Davis, another co-author also affiliated with the Field Museum and the University of Chicago. These crystals contain elements like calcium and aluminum. When the crystals were newly formed, the young Sun continued to flare, shooting protons and other subatomic particles out into space. Some of these particles hit the blue hibonite crystals. When the protons struck the calcium and aluminum atoms in the crystals, the atoms split apart into smaller atoms—neon and helium. And the neon and helium remained trapped inside the crystals for billions of years. These crystals got incorporated into space rocks that eventually fell to Earth as meteorites for scientists like Heck, Kööp, and Davis to study. This time, the team examined the crystals with a unique state-of-the-art mass spectrometer in Switzerland—a garage-sized machine that can determine objects’ chemical make-up. Attached to the mass spectrometer, a laser melted a tiny grain of hibonite crystal from a meteorite, releasing the helium and neon trapped inside so they could be detected. “We got a huge signal, clearly showing the presence of helium and neon—it was amazing,” says Kööp. The bits of helium and neon provide the first concrete evidence of the Sun’s long-suspected early activity. “It’d be like if you only knew someone as a calm adult—you’d have reason to believe they were once an active child, but no proof. But if you could go up into their attic and find their old broken toys and books with the pages torn out, it’d be evidence that the person was once a high-energy toddler,” says Heck. Be the first to comment on "Ancient Blue Crystals Reveal What the Early Sun Was Like"